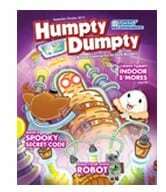 Humpty Dumpty Magazine Subscription just $12.74/Year! What a great price for a one-year subscription to Humpty Dumpty magazine! This Best Deal Magazines “Daily Special” offer is only valid today only. Great gift idea for any kids on your shopping list! Order your subscription from Best Deal Magazines for just $14.99. Use Promo Code 15SS1215 to get yours for just $12.74/year! This offer is good on 12/13 only!